We’ve known it for some time now: sleep is integral to our health. Over the years, numerous studies have shown the adverse effects of sleep deprivation and poor-quality sleep on our mental faculties, physical abilities, and even our psychological state. Regular doses of ample shuteye, it seems, deserve a place alongside our pillboxes and prescriptions. But what can you do when our body’s self-healing mechanism needs curing, too? Do you need more supplements for that? While vitamins and supplements can help repair your sleep, there are also several natural remedies you can try. One of these is meditation, which has been shown to have restorative effects on both our minds and bodies. And when it comes to meditation techniques, Chinese tradition can teach us something about their use as a healing art. Qigong, or qi gong/chi gong, is a system of practices centered around developing one’s overall well-being. Translated literally, “qigong” means “cultivation of life energy,” which points to its core philosophy: the qigong system aims to facilitate the flow of qi, or life energy, within a practitioner’s body. In turn, this leads to a more balanced outlook, enhanced vitality, mental agility and resilience, and improved physical health. While meditation is an essential part of qigong, the system traditionally combines meditation practice with other techniques like gentle movement sequences, specific poses, and regulated breathing. Though qigong might share some meditation methods’ emphasis on correct posture or alignment, qigong stands apart with its equal attention to the notion of flow as an essential aspect of balance and tranquility. With qigong, stillness and movement are two sides of the same coin. Where Did Qigong Come From? As with many ancient traditions, pinpointing qigong’s exact origins can be a difficult, if not impossible, task. Qigong weaves through the histories of many aspects of Chinese culture: traditional medicine; belief systems like Daoism, Buddhism, and Confucianism; and even social health policies championed by various iterations of the country’s government over the years. Around the 1940s, however, the Chinese government started using routines for citizens’ “self-cultivation” and rehabilitation, and with this came a state-backed initiative to unify the disparate qigong practices into one standard system. The qigong that comes to us today, with its emphasis more on health and medicinal benefits rather than philosophy or spirituality, is heavily shaped by this history. This isn’t to say that qigong has been stripped of its philosophical or spiritual dimensions entirely. Many of the core principles that qigong carried over from Daoist and Buddhist philosophy endure in modern practice. Though practitioners no longer need to seek tutelage from, say, secretive masters or forego society to practice qigong in mountain hermitages, qigong still serves as more than just a set of exercises. As an example, today, qigong practices still anchor their purpose on the notion of qi or life energy. Qi or chi finds its roots in Daoist philosophy. Like the idea of the prana in yoga, qi is often correlated to the breath, but it signifies a lot more than just inhaling and exhaling. Qi is also widely understood as energy, and it refers to the vital energy or life force that permeates all of creation, including people. According to Chinese traditions, that energy circulates within each of our bodies through pathways called “meridians.” This circulation of qi is responsible for the energy that infuses our limbs, our organs, our minds. Qi’s continuous and balanced flow along your internal pathways means good health and vitality; conversely, any blockages, stagnation, or disparities in concentration can bring pain, weakness, and illness. For practitioners, qigong—including qigong meditation—is a way to develop your qi reserves and ensure that it flows well along your internal pathways. The idea is to keep the flow of energy within you strong, balanced, and steady—hence qigong’s emphasis on equanimity and relaxation. If you’ve ever suffered a cramp from keeping your fist clenched or your shoulders tensed, you know why qigong sees an inability to relax as one of the many factors that can crimp or impair your body’s normal functions. What Are the Benefits of Qigong Meditation? Studies have found that qigong practice boosts immune responses to infection, particularly in older adults. Recent evidence also suggests that qigong may help reduce the symptoms of depression, anxiety, and other mood disorders. Graduate students in counseling reported significant positive effects on their internal state following a 15-week stress reduction course that incorporated qigong. Most importantly for us here at Good Night’s Rest, studies also indicate that sustained qigong practice improves sleep duration and overall psychological health. How Do You Start Qigong Meditation? There are different kinds of qigong practice, and depending on the tradition, meditation can entail staying stationary (whether in a certain pose or simply sitting/reclining) or performing a series of precise movements. This makes qigong one of the more versatile options available for would-be meditators since it can cater to varied physical capabilities, preferred levels of exertion, and so on. Which techniques you’ll use will depend on the style you’ve chosen to practice. Unlike other methods, then, qigong meditation is best begun with a reliable instructor or resource on hand. The techniques involved—and their particulars—differ across qigong traditions, and it’s best to have expert guidance when figuring out which style works best for you. This is especially important if you’re interested in carrying out a more active qigong meditation practice, as this requires precision of form and quality of movement that would be difficult to achieve on your own. Since there are so many ways to practice qigong meditation, you’ll find that the web is replete with sources offering all kinds of information for beginners and experienced practitioners alike. Here at Good Night’s Rest, we’ve got some sites which we’ve found to be reliable, informative, and accessible—perfect for an aspiring beginner. You can check out our list here. When you hear of slow movements, steady breathing, and, well, qi, you might think: Hey, isn’t that tai chi? While the more active strains of qigong meditation may call to mind the motions of tai chi, and the names of each practice sound similar, qigong and tai chi aren’t the same thing. Qigong is by far the older art, and it has a broader scope: in the cultivation of qi or energy, after all, movement is just one possible tool. Tai chi, meanwhile, is more of a martial art. 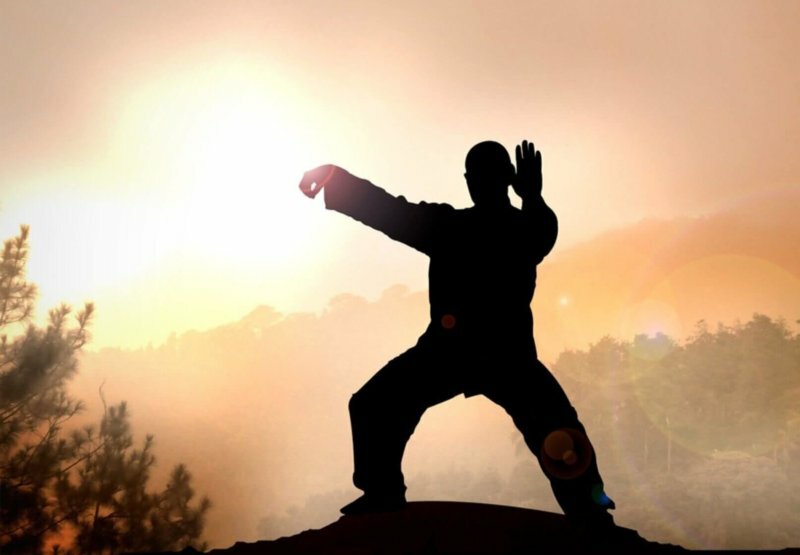 In fact, the “chi” in tai chi isn’t even referring to the same “qi” as qigong: in tai chi, it stands for “extreme” or “ultimate,” and the form’s full name—tai chi chuan or taijiquan—means “grand ultimate fist,” refers to the active harnessing of opposing forces or extremes in a system of attack and defense. While the concept of qi or energy is still part of tai chi’s underlying philosophy, tai chi chuan and qigong have distinct goals and different forms and methods. That said, tai chi and qigong do share the same core method: slowness. When you practice qigong, be it as a sitting meditation focused on the breath or as a series of poses that you repeat each morning, you are advised to slow down and immerse yourself in the endeavor.